40% of customers will make their opinion after seeing one to three reviews, compared to 88% who read up to ten reviews first. 94% of customers see a business with a four-star rating or higher worth using. Reviews influence as much as 10% of ranking for local searches. The sheer volume of options out there for dining, hotels, or attractions means that a strong review can have more weight than a weaker digital presence. However, you can use these trends to your benefit by encouraging more guest reviews from people who have a good experience. What Can You Do To Get More Guest Reviews? The key to getting more reviews is that you don’t want to limit yourself to only one path. For example, there may be some people who swear by TripAdvisor, while others favour Zomato or Google. Ideally, you’re going to want to have a strong positive review presence on both. While 70 per cent of customers will be willing to leave a review if asked, you want to make sure that the experience they record is positive. To accomplish this, on top of providing a great experience (of course), you want to make sure that you offer as many different means as possible for a guest to leave a review. These include both in the digital realm and during their actual physical experience. The best time may be able to reach out to a guest when they are getting ready to leave. Here, your staff has the obvious benefit of being able to read the guest in question to see if they would make a good candidate for a review. Are they already happy and talking about how much they enjoyed themselves? Take the extra step and encourage them to leave a review. A less direct way to do it is leaving a message board in a prominent place. Depending on the type of business, you may want to give some sort of physical reminder to provide a review as well. In a hotel, a lovely postcard with a reminder inside is good. For a restaurant, you may want to leave a small reminder on the customer’s receipt. While the bulk of customers who have a good experience don’t mind sharing it, your biggest roadblock may be basic human distraction. A lot of people say they will leave a review but simply forget. This is why you want to make sure you use digital means that can remind the customer about a review after they leave. One example is taking that postcard idea to another level. For example, a hotel may send an email to a customer after their stay thanking them for a visit, then encourage them to review or fill out a survey. Social media is a great opportunity as well. If a customer leaves a positive comment on your restaurant’s social media channels, ask them if they would be willing to share it on a review platform as well. Statistically speaking, people are most likely to leave a review unprompted if they had either an extremely positive experience or extremely negative experience. You want to get things that are positive but still closer to the middle overall, because the added volume will help your search ranking. You can use your digital platforms to help boost your efforts in the area. For example, we already talked about encouraging customers to leave reviews on social media, but what about using social media itself to promote positive reviews? This is useful because it allows you to reach customers who may be looking at your business but wouldn’t be interested in looking at reviews on their own just yet. This practice is common for businesses like restaurants where someone may be striving to choose options based on location or price first. Essentially, treat your social media platforms like a testimonial section of a traditional business website. Another thing that we should talk about when it comes to social media and digital marketing is how to handle a negative review. In some cases, you may get a negative review for an issue out of your control, but people won’t know that when they read it. The last thing you want to do is try to remove it or get defensive, as this only gives more credence to whatever issue the person mentioned. Instead, leave a comment apologising for the issue and explaining what you are doing to fix it. This way, when someone sees the negative review, their concerns are instantly defused by your response. A TripAdvisor survey showed that 85% of users felt that a thoughtful response to a bad review improved their impressions of a business overall. Working to get guests to leave reviews for your business is walking a bit of a fine line. Go too far, and they may feel put off by your efforts. Not going far enough, and they may not be aware that you’re looking for reviews at all. 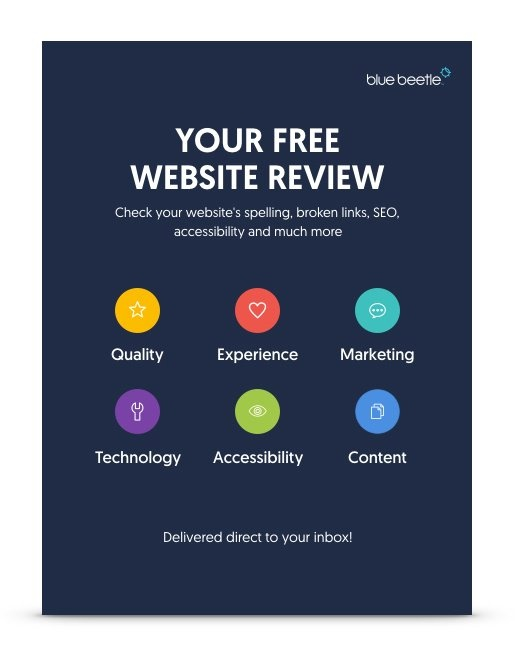 Blue Beetle is great when it comes to helping navigate this balance, with digital marketing and web design that will help you draw in more customers and target the ideal candidates to ask for reviews for your restaurant. We can help you create a true organic base of positivity for future potential customers to see.